What we want is some criterion which will allow us to distinguish science from any other discourse. In other words what makes science, science, as opposed to religion? What is specific to the method of science? Our simplest response to this question is that science deals with facts that are objective (out there in some way) and that religion has to do with belief and is subjective. We might want to say, then, that science is true, and religion is not. When we looked at this simple definition, however, the less certain and clear it seemed. For the idea that science is made up of many observations of facts that are then converted into theories breaks down in the problem of induction, which, in its most succinct form, is the impossibility of leaping from a singular judgement to a universal one. No amount of logical finessing will get you from a particular to a universal. This would seem to imply that science is no more objective than religion, and that a theory is as much a belief as any faith. Moreover, it was also clear that the inductionist picture of science was not accurate at all, since facts are not just littered throughout the world such that we pick them up and notice common characteristics from which we then construct some universal law. On the contrary, we already come to facts with a pre-existing theory, which determines which facts we take as relevant or not (or even which fact we can see). As Ladyman explained, Newton did not find the law of gravity in Kepler’s data, he already had to have it in order to interpret the data (Ladyman 2002, pp.55–6). 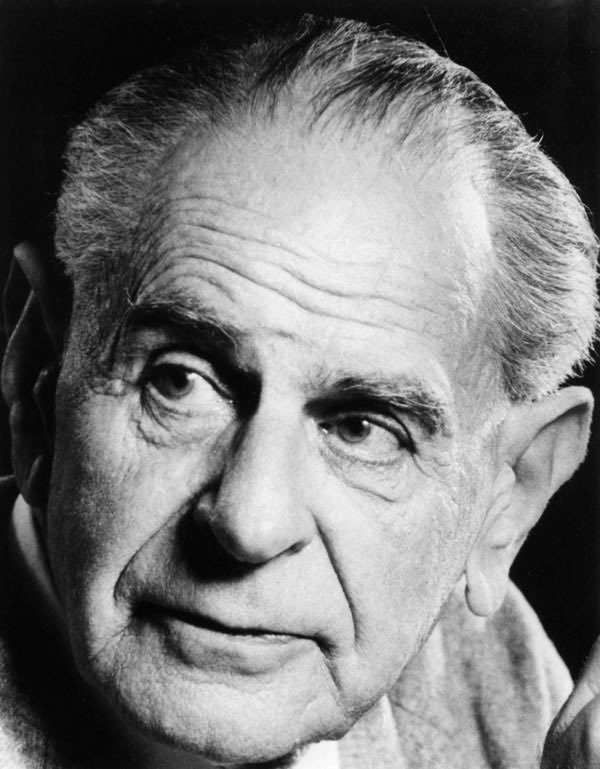 This reversal of the relation between theory and facts, that theory is first and facts second, is the basis of the next philosophy of science that we shall look at, Popper’s theory of falsification, and indeed rose out of the insurmountable problems of ‘inductionism’. His argument is that we should give up induction as the basis of science, but such a rejection would not lead to irrationalism. Rather we substitute for induction, deduction. But did we not argue already in the first lecture that deduction could not be the basis of science, since deduction is merely tautological? Deductive logic tells us nothing new about the world, but only analyses what we already know, whereas as would say that science actually tells us something about nature that we didn’t know before. The real difference between science and religion or any other discourse is not the theories or hypotheses put forward, but how they are tested. Popper is adamant that science is creative as any other human discourse and that the origin of this creativity is outside any logical explanation. That someone comes up with such an idea at such a time cannot be rationally explained. Thus we don’t know how Galileo or Einstein came up with their ideas, and why not someone else, or at different time and place, but what we do know that what makes these creations scientific, as opposed to anything else is that they can be falsified (this is the difference between context of discovery and context of justification). In the opposite case, it does not seem possible to falsify a religion logically. I can always find a reason to believe something. Think for example of the classic problem of evil in theology. How do I justify the existence of God with evil in the world? It is perfectly possible to find such a reason, as Leibniz did that this is the ‘best of all possible worlds’, and it is just our lack of human understanding that prevents us from seeing it so. This distinction between authentic and inauthentic ad hoc modifications of scientific theories, however, tells us that we should not over-estimate falsifications of theories. When we look at the history of science we can see that ad hoc modifications can confirm rather than deny a theory. Take the case of the discovery of Neptune. Irregularities in the orbit of Uranus predicted that there must be another planet that had not be observed. Rather than reject Newton’s theory, scientists argued that a planet must exist that would explain it. Thus, the fact that Neptune was found in 1846 confirmed Newton’s theory rather than falsified it. Rather than seeing science as just a series of falsifications which lead from theory to the next, Aristotelianism to Newtonism to Einstein, we should see it as the confirmation of bold conjectures and the falsification of cautious ones. For what difference does it make to science if one falsifies conjectures such as the universe is made of porridge or confirms a cautious one? But how then do we determine what makes a bold conjecture? The only answer to this must be background theories themselves, for only in relation to them could we know what would be bold or timid. The background knowledge is therefore the cautious conjecture (what we take to be correct) and the bold conjecture flies in the face of what everyone thinks is the case. We can see, then, what the real fundamental difference between the falsificationist and inductionist is. The first takes the history of science seriously, and the second has no conception of the history of science at all. There is no background knowledge. Rather facts are accumulated as though there were no context at all and science existed in the eternal present. Moreover, when we actually look at science, it does not take the simple form of ‘All swans are White’…. Rather, sciences are made up of complex collection of universal statements which are interrelated to one another. Now if a prediction tells us the theory is false it tells is that one of the premises might be wrong but not which one or even that our own experience might be the problem. It might not the theory that is out, but the ‘test situation’ itself, because we cannot isolate the premise which allows us to falsify the theory (this is known as the Duhem/Quine thesis). So to use Ladyman’s example, if we were to try and predict the path of a comet, the law of gravity would not be sufficient, so if the predication were incorrect we would not know that it was the theory of gravity that was being falsified or something else (Ladyman 2002, pp.77–8). Even if such an isolation were possible, falsification does not seem to capture actually what science and scientists do, for when we look at the history of science we do not find one great conjecture following another, but that scientists stick to their theories despite the fact that they can be falsified or they adopt a new hypothesis even though all the known evidence at the time should have killed them off at birth. This is what we find when we look at the detail of the eventual transition from the Aristotelian to the Copernican view of the world as Feyerabend and Kuhn describe it. It is certainly was not the simple falsification of the one by the other. Science works, to some extent, because scientists are dogmatic and not open to falsification. If that is the case, how is it possible to differentiate, or demarcate, science from any other dogma? Will we not have to use different criteria? When we look at science as a method this is a problem. We might ask, however, if we think of science as an activity, whether it is such a problem. Moreover, it was also clear that the inductionist picture of science was not accurate at all, since facts are not just littered throughout the world such that we pick them up and notice common characteristics from which we then construct some universal law. On the contrary, we already come to facts with a pre-existing theory, which determines which fact we take as relevant or not (or even which fact we can see). As Ladyman explained, Newton did not find the law of gravity in Kepler’s data, he already had to have it in order to interpret the data (Ladyman 2002, pp.55–6). This reversal of the relation between theory and facts, that theory is first and facts second, is the basis of the next philosophy of science that we shall look at, Popper’s theory of falsification, and indeed rose out of the insurmountable problems of ‘inductionism’. His argument is that we should give up induction as the basis of science, but such a rejection would not lead to irrationalism. Rather we substitute for induction, deduction. But did we not argue already in last lecture that deduction could not be the basis of science, since deduction is merely tautological? Deductive logic tells us nothing new about the world, but only analyses what we already know, whereas as would say that science actually tells us something about nature that we didn’t know before. The real difference between science and religion or any other discourse is not the theories or hypotheses that they put forward, but how they test them. Popper is adamant that science is creative as any other human discourse and that the origin of this creativity is outside any logical explanation. That someone comes up with such an idea at such a time cannot be rationally explained. Thus we don’t know how Galileo or Einstein came up with their ideas, and why not someone else, or at different time and place, but what we do know that what makes these creations scientific, as opposed to anything else is that they can be falsified (this is the difference between context of discovery and context of justification). In the opposite case, it does not seem possible to falsify a religion logically. I can always find a reason to believe something. Think for example of the classic problem of evil in theology. How do I justify the existence of God with evil in the world? It is perfectly possible to find such a reason, as Leibniz did that this is the ‘best of all possible worlds’, and it is just our lack of human understanding that prevents us from seeing it so. This distinction between authentic and inauthentic ad hoc modifications of scientific theories, however, tells us that we should not over-estimate falsifications of theories. When we look at the history of science we can see that ad hoc modifications can confirm rather than deny a theory. Take the case of the discovery of Neptune. Irregularities in the orbit of Uranus predicted that there must be another planet that had not be observed. Rather than reject Newton’s theory, scientists argued that a planet must exist that would explain it. Thus, the fact that Neptune was found in 1846 confirmed Newton’s theory rather than falsified it. Rather than seeing science as just a series of falsifications which lead from theory to the next, Aristotelianism to Newtonism to Einstein, we should see it as the confirmation of bold conjectures and the falsification of cautious ones. For what difference does it make to science if one falsifies conjectures such as the universe is made of porridge or confirms a cautious one? But how then do we determine what make a bold conjecture? The only answer to this must be background theories themselves, for only in relation to them could we know what would be bold or timid. The background knowledge is therefore the cautious conjecture (what we take to be correct) and the bold conjecture flies in the face of what everyone thinks is the case. We can see, then, what the real fundamental difference between the falsificationist and inductionist is. The first takes the history of science seriously, and the second has no conception of the history of science at all. There is no background knowledge. Rather facts are accumulated as though there were no context at all and science existed in the eternal present. What we want is some criterion which will allow us to distinguish science from any other discourse. In other words what makes science, science, as opposed to religion? What is specific to the method of science? Our simplest response to this question is that science deals with facts that are objective (out there in some way) and that religion has to do with belief and is subjective. We might want to say, then, that science is true, and religion is not. When we looked at this simple definition, however, the less certain and clear it seemed. For the idea that science is made up of many observations of facts that are then converted into theories breaks down in the problem of induction, which in its most succinct form, is the impossibility of leaping from a singular judgement to a universal one. No amount of logical finessing will get you from a particular to a universal. This would seem to imply that science is no more objective than religion, and that a theory is as much a belief as any faith. Moreover, it was also clear that the inductionist picture of science was not accurate at all, since facts are not just littered throughout the world such that we pick them up and notice common characteristics from which we then construct some universal law. On the contrary, we already come to facts with a pre-existing theory, which determines which fact we take as relevant or not (or even which fact we can see). As Ladyman explained, Newton did not find the law of gravity in Kepler’s data, he already had to have it in order to interpret the data (Ladyman 2002, pp.55–6). The real difference between science and religion, or any other discourse that is not science, is not the theories or hypotheses that they put forward, but how they test them. Popper is adamant that science is creative as any other human discourse and that the origin of this creativity is outside any logical explanation. That someone comes up with such an idea at such a time cannot be rationally explained. Thus we don’t know how Galileo or Einstein came up with their ideas, and why not someone else, or at different time and place, but what we do know that what makes these creations scientific, as opposed to anything else is that they can be falsified (this is the difference between context of discovery and context of justification). In the opposite case, it does not seem possible to falsify a religion logically. I can always find a reason to believe something. Think for example of the classic problem of evil in theology. How do I justify the existence of God with evil in the world? It is perfectly possible to find such a reason, as Leibniz did that this is the ‘best of all possible worlds’, and it is just our lack of human understanding that prevents us from seeing it so. If what makes a scientific theory scientific is falsification, what exactly makes a falsification? Can any falsification be scientific? Such a broad generalisation does not seem to be correct because just to falsify something would not make it a scientific theory. I could falsify physics, by quoting Genesis but no one would think that I was being scientific. The answer here is intersubjective testability. One cannot conceive of how it would be possible to set up an experiment that would test my falsification of physics that claimed God had created the universe in the way that it is described in Genesis. One can imagine, however how it might be possible to test the falsification of Newtonian science through the prediction made by Einstein, which is entirely what the example from Eddington proves, and it is perfectly possible that other scientists could conceive of such an experiment, whether in principle or in practice. This distinction between authentic and inauthentic ad hoc modifications of scientific theories, however, tells us that we should not overestimate falsifications of theories. When we look at the history of science we can see that ad hoc modifications can confirm rather than deny a theory. Take the case of the discovery of Neptune. Irregularities in the orbit of Uranus predicted that there must be another planet that had not be observed. Rather than reject Newton’s theory, scientists argued that a planet must exist that would explain it. Thus, the fact that Neptune was found in 1846 confirmed Newton’s theory rather than falsified it. Rather than seeing science as just a series of falsifications which lead from theory to the next, Aristotelianism to Newtonism to Einstein, we should see it as the confirmation of bold conjectures and the falsification of cautious ones. For what difference does it make to science if one falsifies conjectures such as the universe is made of porridge or confirms a cautious one? But how then do we determine what make a bold conjecture? The only answer to this must be background theories themselves, for only in relation to them could we know what would be bold or timid. The background knowledge is therefore the cautious conjecture (what we take to be correct) and the bold conjecture flies in the face of what everyone thinks is the case. We can see, then, what the real fundamental difference between the falsificationist and inductionist is. The first takes the history of science seriously, and the second has no conception of the history of science at all. There is no background knowledge. Rather facts are accumulated as though there were no context at all and science existed in the eternal present. Moreover, when we actually look at science, it does not take the simple form of ‘All swans are White’…. Rather, sciences are made up of complex collection of universal statements which are interrelated to one another. Now if a prediction tells us the theory is false it tells is that one of the premises might be wrong but not which one or even that our own experience might be the problem. It might not the theory that is out, but the ‘test situation’ itself, because we cannot isolate the premise which allows us to falsify the theory (this is known as the Duhem/Quine thesis). So to use Ladyman’s example, if we were to try and predict the path of a comet, the law of gravity would not be sufficient, so if the prediction were incorrect we would not know that it was the theory of gravity that was being falsified or something else (Ladyman 2002, pp.77–8). When we look at science as a method this is a problem. We might ask, however, if think of science as an activity, whether it is such a problem.